Description: Success of the Kenner Tree Tots led to introduction of the Mountain Tots. Opposed to living in a tree, the Mountain Tots live inside a huge magical mountain. Push a button and twist the mountain to reveal a furnished home inside. The home includes a hand-crank elevator that lifts Mountain Tot figures from the livingroom to a mine shaft. 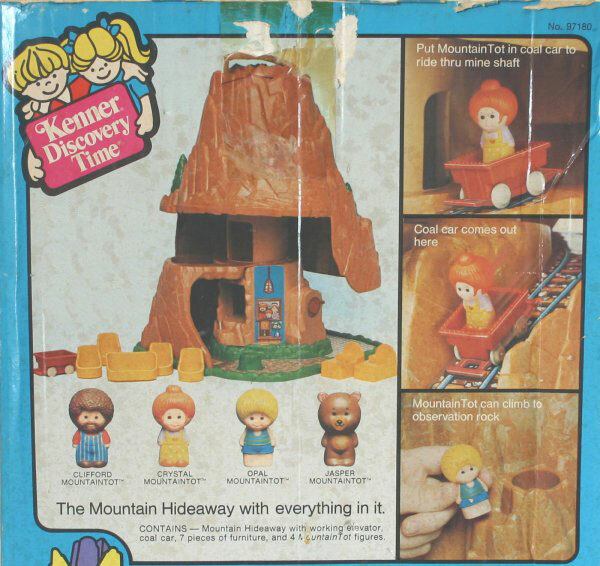 Set includes a mine cart that races down the mine shaft ramp to exit on the other side of the mountain. KTT77 - Mountain - Mountain Tots Hideaway opens like magic at the push of a button (carry handle and push button on top of mountain). Twist top of mountain to reveal a hideaway inside. 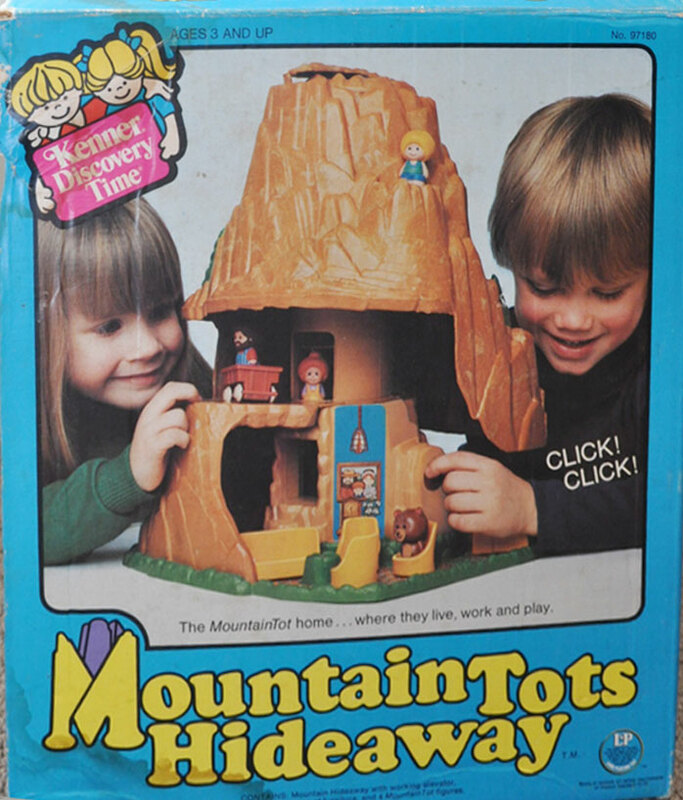 The hideaway includes a living quarters, sleeping quarters, and an elevator that lifts Mountain Tot figures from the living quarters to a mine shaft. 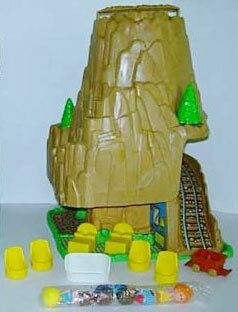 The side of the mountain includes a bear cave with a fold-down door and the mountain has 2 round areas to place trees or figures. 2 each - KTT78 - Tree - Round 1-piece hollow plastic tree (one side flat fot fit against mountain) with a round base to fit within the round area on the side of the Mountain. 2 each - KTT79 - Bed - Small yellow rectangular bed with a rounded headboard and an indent in the pillow area (to prevent figure from rolling off the bed). 4 each - KTT80 - Chair - Round yellow single-seat chair with a high backrest. 1 each - KTT81 - Couch - Rounded yellow two-seat couch with a high backrest. KTT82 - Coal Car - Small red squared coal car that rolls on 4 small wheels. KTT83 - Man - Clifford Mountain Tot - Man with brown hair, beard and moustache, brown shirt, blue/white striped overalls and red shirt sleeves. KTT84 - Woman - Crystal Mountain Tot - Woman with orange hair in a bun wearing orange shoes and a yellow dress with an orange heart on the chest apron.